Def Leppard played a show on the Downstage Thrust tour in Walker, MN on 11th July 2007 and an archive concert review is available to read. ClassicRockRevisited reviewed the show which took place at the Moondance Jam. A second review is also available from this show. "Drummer Rick Allen and bass player Rick Savage have been playing together so long that they handle the tempo changes with ease and never even have to glance at each other during the show. 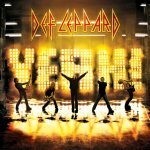 Vocalist Joe Elliot is a great showman."